LTH Home > Chat > Beyond Chicagoland > Albuquerque? A few months from now we'll be taking a short trip to Albuquerque, staying in the Los Ranchos de Albuquerque area. I've searched the board and read the recommendations here for Santa Fe -- and we certainly will get up to Santa Fe during our trip -- but I would love to know about great places to eat in Albuquerque itself, especially for New Mexican cuisine. Excellent green chile, the best I had in New Mexico or Arizona. Thanks, Joel. I knew you had recently been in that area, but somehow I missed your Albuquerque reference. The Owl sounds great! It has been more than a few years, so take these two recommendations with a grain of salt. That caveat entered, I must confess that these two places are among the highlights of my several trips to New Mexico, including a number of trips to Santa Fe where I think the food is truly wonderful. It took me a while to track these down, but I did so because I had such a wonderful (albeit different) time at both. I truly hope that they haven't changed much and that, if you're able to visit either (or both), that you enjoy them as much as I did. Gypsy Boy, thank you! Both of these places sound wonderful. We will have a car during our stay, so getting out to El Pinto won't be a problem. I'm really looking forward to this trip! I haven't eaten there in several years, though. Coincidentally, last week on vacation my father called me from the courtyard pictured at the link above to torture me with a play by play of his blue corn pancake breakfast. If you have any openings on your Santa Fe dance card and are into Sunday brunch, La Posada has one you might want to consider. I've only been once, but it was far and away superior to standard hotel buffet/brunch fare. I definitely plan to return as soon as the summer tourist crowd thins out. I'll let you know how it turns out. Maybe we could meet up. In case you guys aren't interested in having green or red chile for every meal, there is a great little Japanese place called Kasasoba which is part of the Sanbusco complex in Santa Fe. The dinner menu is mainly "small plates". It is easy to over-indulge with this style of menu; my wife and I ran up a $180 bill the other night, but I hadn't eaten all day. A sign of how good this place is: you often spot the chefs of Santa Fe's best restaurants dining there on their day off. Now this is *Mexican* and not *New* Mexican! Family-owned, some tables out front, very laid-back, extremely welcoming. Their lingua in brown sauce with vegetables (peas, carrots, onions, etc.) is simply to die for. Lot's of people love New Mexican food, especially New Mexicans (whodathunk?). But I'm not one of them. Having cut my teeth on the rich, regional cuisines of Mexico, I find the local adaptations to be, at best, pale imitations, often with an overdependence on heat from chiles to mask a lack of skill in combining ingredients. I've been to many of the touted places in SFe and ABQ and at private homes with dishes lovingly prepared by 'buelitas. Must be something wrong with me. Even the traditional Mexican food here is sub-par. Most of the recent immigrants come from Chihuahua, which has the least interesting cuisine of the Mexican states. You can get vastly better regional Mexican fare in your fine city. So where do I eat when I'm in ABQ? Sounds strange, but I most look forward to a Hebrew National hotdog at the snack bar in Costco. My husband lived in Albequerque for a summer. We liked the Route 66 Diner for breakfast -- try the Pile-Up. For New Mexican food, we liked the very casual El Patio. Wherever you go, try the sopapillas with honey. Delish! I've never seem them anywhere else like this. And don't forget to answer the official New Mexico state question: Red or Green? Chiles that is! We like green. Sopapillas(w/honey) are a staple in Texan Tex-Mex. Yum. A local landmark across the street from UNM, this 24-hour diner has your basic breakfast/burger options, but despite its no-frills, frenetic atmosphere, I still think it has some of the most consistent (and cheap) New Mexican food around. I would go for breakfast, order the Huevos Rancheros, some Western style hash browns (crispy shoestring potatoes with green chile, onions and cheese), a few carne adovado burritos (pork stewed in red chile; the burritos are small), orange juice (fresh-squeezed), and some extra tortillas. These are, I feel, the best flour tortillas on earth. They are available in bulk, as is the green chile stew and the adovada, all of which freeze well for plane rides home. In addition to the food, the Frontier has great people-watching, and a huge collection of tacky Southwestern art, including a giant John Wayne picture. The Frontier is also affiliated with a local drive-in chicken place, Golden Pride: same great carne adovada, tortillas and breakfast burritos in four or so ABQ locations. Also a good bet for breakfast or lunch, this family-run diner in the North Valley has some of the best chile I've had. The chopped green is smoky and hot, and the red chile is very smooth and slightly sweet. Mary and Tito's devotes some of their menu to another New Mexico specialty, stuffed sopapillas: fried pastry filled with either beef, pork, carne adovada, beans, etc. which are always too much for me, but I hear the ones here are good. Plus, M & T's is on 4th Street - easily one of the weirdest (and interesting) streets around (should you need any taxidermy work or a tattoo while you're visiting). A sign on the door of this Route 66 diner directly informs vegetarians that the establishment regrets that there isn't anything inside for them. This translates into very porky green chile sauce, which is fantastic on their gigantic breakfast burritos, but the red chile is also very good. Order it "Christmas" and have half and half. This place is also on a stretch of Central with a lot of old motels in various degrees of funkiness/seediness, which is a plus for those interested in 50's American architecture and decor. As seen above, most of my haunts for New Mexican food are best for breakfast or lunch, mostly because of atmosphere (bright, diner-like), but also because this food is HEAVY and coffee can help counteract the effects. When I want NM food in the evening, I go to Las Montanitas, a fixture in the North Valley in an old adobe house. The patio is one of the best around (too bad you're visiting in January, Amata! ), but the interior is great too: many tiny rooms with uneven floors and a claw foot tub in the ladies' room. The dish here is the posole: hominy stewed with pork and green chile, which they serve with every meal. For the first couple of years we lived in New Mexico, my Mom and I would try making our own on Christmas Eve, when it is traditionally served. Now we just buy a quart here. The stacked blue corn enchiladas are also very good. Speaking of Christmas Eve, check out this neighborhood bakery for biscochitos, cookies traditionally served during the holidays but made here year-round. They are sugar cookies made with lots of lard. These folks will ship them anywhere in US very cheaply, and are also known for their "bread turkeys," dough shaped into fowl for your vegetarian friends. This spot is on a cute stretch of Mountain near Old Town and the Museum District. A local chain of New Mexican restaurants that are always reliable and reasonably-priced, with notable flour tortillas. My favorite outpost is on Central near Old Town, so it would be a good choice if you are checking out the plaza. A local chain of small grocery stores for stocking up on red and green chile, piñon nuts, pumpkin seeds, and good flour tortillas (try Albuquerque Tortilla Company). Insanely cheap produce. After always having the option of adding green chile to a burger while living in New Mexico, eating burgers since has always been a bit sad. This New Mexico chain has some of the best, although ordering a green chile cheeseburger anywhere in the state is usually a solid choice. Although it appears to be strictly fast food, everything is cooked to order and benefits from years of grill grease. I haven't tried the recently-added breakfast burritos, but my Dad, the king of grease, says they are great. There are probably 40 locations in the area, but my I have included the address of my favorite below. It's a popular lunch spot for North Valley farmers and builders, and you can enjoy a million dollar view of the Sandia mountains across the parking lot, while sitting under a red and white tin 50's style umbrella on plastic stools. A very New Mexico scene. Plus, one of the outposts of the Fruit Basket is a few blocks away. Dos Hermanos is indeed very good for traditional New Mexican, although the atmosphere of both locations I have visited is a bit utilitarian. They give the Frontier a run for their money on tortillas, and my family always gets tamales from DH on Christmas Eve. They are used to handling large to go orders, but call ahead during the holidays. In contrast, the setting at El Pinto is hard to beat - great mountain views and charming patios- although it is a gigantic operation which can be overwhelming and/or alienating. Their food, the last couple of times I've been at least, suffers from this large scale approach. A great place for chips and beers, though. 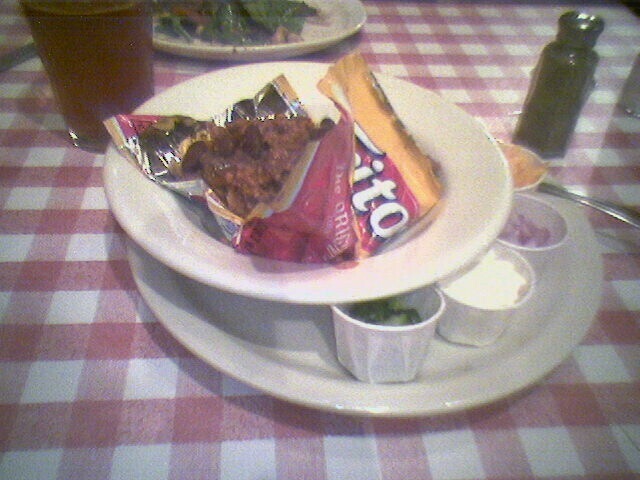 The Cowgirl Cafe in Santa Fe does have amazing Frito Pie (an essential NM dish), plus a vegetarian version. Unlike Bill, I do love New Mexican food, but I think he made some valuable points. I have lived in both Mexico and NM, and NM food is certainly very different from interior Mexican. As a result regional Mexican (not New Mexican) places in Albuquerque can be pretty uninspired. There are some folks, though, who make incredible New Mexican dishes. The key is to find out what each restaurant/family/town specializes in and go from there. Bill's comment reg. masking flavors behind chile is important because it highlights the absolute necessity of making quality red and/or green chile sauces for this cuisine. Also, if you ever get the chance to attend a feast day at one of the neighboring Pueblos or eat with a Native American family from the area, you will encounter numerous (and delicious) dishes not found at local restaurants, and should be considered an important part of checking out traditional New Mexican food. Below are a few of my non-New Mexican food places in Albuquerque, which I hope you'll enjoy, Bill. Next time I'm at Costco I'll go hungry! Pizza place and brewery in the Nob Hill neighborhood with a small but well-executed menu of wood-oven baked pies, sandwiches, salads and lasagna. They have good wines by the glass and great beer: the Wet Mountain IPA is amazing and is available to go by the jug. Also in Nob Hill, they have fountain drinks and desserts, and good sandwiches. You can grill your own outdoors, or they will do it for you tableside. Way up in the heights (close to the Sandia mountains), and in a strip mall, but cheap, good, and run by nice people. Several steps above bar food, with a nice patio, good salads and burgers, and sandwiches. An informal, kid-friendly place in the North Valley with a superlative patio. Great burgers, Greek specials, steaks, and decent barbeque. Large beer and wine selection. They have indoor seating, but the patio's really where it's at. Tucked away in old adobe in Old Town, a good place for a tart or crepe and a glass of wine. Wow! Thanks to everyone who's contributed ideas here in this thread, and especially edeben, for her in-depth knowledge of Albuquerque! Thanks again, and I'm really looking forward to exploring NM. We will definitely report back. This is a much belated report of a trip to New Mexico in January 2006 – Antonius and I posted about one meal during that time, at Bobcat Bite, but I never got around to posting the rest. I’ll remedy that now. Antonius has a bunch of photos he’ll post after this. We stayed in Los Ranchos de Albuquerque, a semi-rural separate town near the Rio Grande with lots of trees, trails to explore, and horses and other animals about, renting a little cottage at Casita Chamisa. Leisurely, lovely breakfasts were served in the main house: for example, blue corn pancakes our first morning there. The night we arrived we were too tired to navigate through the city looking for any of the LTH-sanctioned places, so we took our innkeeper's suggestion of a nearby spot, Casa de Benavidez, said to be strong on fajitas. Antonius had the fajitas; I had carne adovada, "Christmas" (half with green chile, half with red chile), plus a very good sopaipilla. As with many of the places we visited in Albuquerque, Casa de Benavidez had a beautiful patio which would be great in warmer weather: in January we could only admire the fountain and lights through the window next to our table. Not a bad choice for an introduction to New Mexican dishes. Our second day was a busy mix of back-country exploration, lunch at Bobcat Bite, a short but intense interval of Santa Fe shopping, conferencing for me, and a late-ish dinner. Again something close to our casita was appealing, and we tried edeben's recommendation of Geezamboni's, which had just changed its name to something equally eccentric: JohnDhi's. Geezamboni's/JohnDhi's offers brisket and barbecue chicken done on their own smoker -- Antonius and I split sandwiches of each. The brisket there was not bad, but nothing comparable to GWiv's (and if only we had remembered in time the mantra "sauce on the side"!) The chicken, though, was really excellent. Antonius also sampled a seasonal offering from New Belgium in Colorado that he pronounced very good. The next day we visited one of the Indian pueblos of north-central New Mexico, where one of the major winter ceremonies was taking place. We felt very privileged to be able to attend and watch the dances, and especially to be invited afterwards into one of the private homes in the pueblo to partake in their feast. The pueblos in general prefer to have little information made public about their religion and traditional practices: no photography is permitted during the ceremonies, for example, and out of respect for their wishes I will not describe the dances. But we're told that describing what we ate will not cause offense. Our hosts had prepared a huge spread, ready for many guests who would drop in during the course of the day. The offerings included posole, red chile with pork, roast beef, turkey, chicken and rice, potato dressing, pasta salad, bread pudding, another dessert that I’ve forgotten, Kool-aid, pepsi, and wonderful Pueblo bread. Dinner that night was at Las Mañanitas, which is an old adobe house, a historical landmark, which used to be a stagecoach stop. Very cool building (another lovely patio it was too cold to enjoy), and excellent food, starting with the small cups of complimentary posole. I had the stacked enchiladas with blue corn tortillas, filled with shredded beef; Antonius had a combination of one rolled enchilada with chicken, a chile relleno, and a tamal, of which he especially praised the chile relleno. The next morning we needed a breakfast which would be quicker and earlier than our B&B could provide, and went down to Garcia's Kitchen near the Old Town area on Central (part of old Rt. 66). A plate of eggs with potatoes, beans, "carnitas" (here referring to a beef stew), and flour tortillas did the job and the kitschy decor was an amusing way to start the day. More Rt. 66 kitsch was in store for us at dinnertime: we traveled east on Central to the university area to try the Frontier Restaurant, another of edeben's recommendations. The Frontier is a huge, 24 hour operation, occupying an entire block. Counter service only. The clientele is beyond eclectic: packs of undergraduates chattering away on their cell phones, scruffy street people, skinny septuagenarians in Harley jackets, ... you name it. And the walls are covered with junk in the cowboy vein, plus giant paintings of John Wayne, Elvis, etc etc. (What's that Bears jersey doing there? Oh, Urlacher is a UNM alum.) Lucantonio unfortunately missed dinner and this scene entirely, falling asleep on the way there, sleeping in a booth, and on through the night. His awake parents, on the other hand, had two carne adovada burritos each. As edeben said in the Albuquerque thread linked above, the burritos are small: compact packets of nothing but the carne adovada, which was especially delicious. And the flour tortillas there are big and unusually thin, with a biscuity flavor. We noticed later, on the bag of a dozen which we took back to Chicago, that baking powder is among the tortilla ingredients. Just before leaving for the airport the next afternoon we hit The Fruit Basket on 4th Street, and stocked up on ingredients: red chiles (both in ristras and loose), fresh green chiles, dried green chiles, crushed dried green chile, chiltepines. We’ve used these ingredients, along with a couple cookbooks we picked up in Albuquerque, to try to recreate some of the great food we had there. But really, we need to get back to New Mexico for another visit soon. Wow, I read your whole post -- even though there was not a single picture in it! I have been fantasizing about building a horno in my backyard -- there's a spot that's away from the house and that gets lousy sun, and so seems a good place to set up a little outside oven for making pizza and bread. I have not disclosed this plan to The Wife, though with the last daughter leaving for college next week, and we two alone, my sense is that she will leap at any opportunity to see my out of the house (if only in the backyard). David, thanks for bearing with my non-illustrated text. Pictures will be added at some point soon. Greetings from a Chicago expatriot in the Land of Enchantment! Back home the first question you are asked is 'Cubs or Sox'. In Albuquerque it is 'Red or Green' as in chili peppers or salsa. Sure they put it on everything (not even a McD's double cheeseburger is safe), but there are a ton of places where they don't speak, or cook, Mexican, New Mexican or Navajo. Case #1 is a prime example - Jinja Bar and Bistro. there are two in ABQ and one in Santa Fe, but if the Westside location at Coors Bypass and Sevilla in ABQ is any example, you will not be disappointed in any of them. Warm greetings from staff as you enter a comfortable environment with mostly soft lighting, enhanced by expansive windows looking out toward the Eastern mountains. Calling the menu 'Pan Asian' with South Pacific influences allows for both familiar items done differently as well as some novel dishes that reach out to the more jaded Oriental diner. Drinks like the Blue Whale martini and Duke's Blue Hawaiian are more fun than the standard Mai Tai or Pina Colada. Appetizers like the Yen-Yang shrimp, with a light crisp batter paired with both hot Asian chili and tropical fuit sauces are served promptly, hot and on a decorated serving plate. The Heavenly Beef entree has two skewers filled with juicy tenderloin, red onion, green and red peppers. Accompaniments include pineapple salsa, marinated cucumbers, a signature carmelized onion, garlic and lime sauce, along with fried brown rice. While everything was delicious the tenderloin dipped in the signature sauce is what makes the beef heavenly. Food excellent, service very good, ambiance comfortable and moderately priced ($100 per couple including drinks) makes Jinga Bar and Bistro a wonderful and highly recommended alternative to Southwestern fair in amazing Albuquerque. Thanks for the information. I will be in Albuquerque next week. I have been putting a list together based on searches of LTH. I also wrote down some Diners, Drive-ins, and Dive places. So any other ideas would be welcome. I would like to keep it moderately priced, say $25 - $30 per dinner entrée. I will be staying in Old Town. dodger wrote: Thanks for the information. I will be in Albuquerque next week. I have been putting a list together based on searches of LTH. I also wrote down some Diners, Drive-ins, and Dive places. The Frontier Restaurant, adjacent to the University of New Mexico, is one of the finest diners that I have been to in years. Great food, good service. And it is open 24 hours. The last time I was there in 2006, my 14yo nephew ran up a bill of $17. Well I have finally had some time. I checked out the Jinja Bar web site. The menu looks interesting. But it is quite a distance from my hotel in Old Town. Do you have any thoughts on cab fares to/from and how easy is it to get a cab in ABQ? The Frontier is on my list. Sorry for another message, but their drink menu look like it was copied from Trader Vic’s? Is their food from there too? The only meal I ate in Alb. several years ago was at "The Owl" -- little diner-y kind of place. Great green chile patty melt. Is it still there? JoelF wrote: The only meal I ate in Alb. several years ago was at "The Owl" -- little diner-y kind of place. Great green chile patty melt. Is it still there? Yes, The Owl Cafe is still there as is the original in San Antonio New Mexico. It is well know for it's green chile cheese burger. Just an fyi on the Frontier, they aren't 24/7 anymore. They were having some problems with unruly patrons late at night so it's open from 5 am to 1 am now. It's across the street from UNM, good New Mexican and basic food and an eclectic crowd. Here's a link to the original Owl in San Antonio, south of ABQ. "It took me a while to track these down, but I did so because I had such a wonderful (albeit different) time at both. I truly hope that they haven't changed much and that, if you're able to visit either (or both), that you enjoy them as much as I did. At the more unprepossessing end of the scale is Dos Hermanos, a local chain (not to be confused by the chain (?) in Chicago). It is locally owned and operated and has probably half a dozen places scattered around. It was recommended to me by the bell captain--a wizened old Hispanic gentleman and I still remember my meal. If I ever go back, it will probably be the top of my list for its prices and its high quality (not to mention its quality). You can find all you want to know at its website, which is here . I dearly and devoutly hope that things haven't changed at those two places. I've rarely been so lucky in local recommendations when not knowing a soul there and would return to either in a heartbeat. Hope I haven't steered you wrong.... "
Well I am back from my Albuquerque trip. It was disappointing. First I did not have as much free time as I would have liked. Certain things just didn’t work out, it was a business trip. For instance I didn’t get to the Frontier Restaurant, or any of the above suggestions. I can’t remember who wrote it or whether it was on LTH or Chowhound, but I would agree with the writer. I ate at two Mexican restaurants in Old Town, both served Mexican food with a New Mexico style. Both disappointed me in very similar ways. I had beef at one and pork Adovada at the other. Both were served with rice and beans. I found the meat overcooked without good flavor. The entire dish was covered in cheese, too much IMO. Service at both was bad. It is my assumption that tourists are probably 90% of their business and the wait staff has concluded that tourists are not very good tippers and thus serve accordingly. I note this not just with my service, but observation of other tables. One of my business associates had a car and one night offered to drive me to his favorite restaurant: Sadie’s of NM. He said he had gone to college in ALB, so I went along. I ordered the same as he did: Green Chili Chicken Enchiladas. Again the chicken seemed overcooked and covered in too much cheese. I was reserved with my opinion, but offered that “I was surprised the chicken was not as spicy as I had thought.” He said they don’t make the meat spicy so people can cover it red or green chilies. I said ok, but that didn’t really help. The restaurant appeared to have a lot of non-tourist business. The service was excellent. And while I didn’t like the food, the margaritas were terrific and very reasonably priced too. North Valley @ 6230 4th ST.
My last night there I couldn’t take it anymore. I went to the front desk and asked if there was a non-Mexican restaurant that didn’t cater to tourists within reasonable cab fare. They suggested the Monte Carlo Steakhouse. I asked if I was under dressed, the front desk people said I wasn’t. Since this name had also popped up on my pre-trip search I went there. The cab driver said it very good. I was surprised when I got there. It definitely met my criteria and I was not under dressed. It was the back half of a package store. I walked in and it was not very big, with all the ambience of a biker bar. It was a decent size and full. I had to wait for a table on a Thursday night. It was a restaurant for locals. The special was 12 ounce Prime Rib, baked potato, salad, and Texas toast for $19. They had an end cut available, so I ordered the special. I was worried when I saw the salad, but everything else was very good. It was a terrific cut of meat, with a lot of flavor, nice size and tasty baked potato. The aus jus was also good. I know I am over rating this place because I was desperate for something not New Mexico Cuisine. But I thought it was absolutely terrific. I have often commented that much of NM cuisine is a far less vibrant version of the original Mexican recipes from which they were derived over the past few hundred years. Chile is too often used to mask a lack of creativity or quality ingredients. The comida nativa can be an incongruous blend of Spanish, Mexican, and Native American influences that was historically limited by an unforgiving climate. Although many of the restaurant personnel are recent arrivals from Northern Mexico, many of the owners of the more established NM-style restaurants are descended from the Spanish Conquistadores. An interesting note: many of these conquistadores were Jews fleeing from the Inquisition who continued to practice their religion and food customs in secret - to this very day. When it comes to pure regional Mexican food - IMHO some of the most wonderful food on the planet - there is no question that Chicago has far better and more diverse offerings. I can't wait to visit (soon!) to try out some of the places I have read about for so long here on LTH. Any recent recs? Have one meal to spend there and would love anything an LTHer heartily recommends.